Paris’ allure puts it fairly high on many people’s travel wish list, and there are considerable savings to be made if you visit the City of Light when you’re 25 or under, or if you’re a student. Though you won’t save money on your airfare, hotel, or food just for being youthful (though you might find these tips for saving money when booking a holiday useful), you can save a good chunk of money on things to do. Unlike here in the UK (not sure what it’s like elsewhere), the French give students and those 25 or under considerable discounts on admission or travel, or completely free access to some attractions. Some students choose to travel during their normal study term, and often enlist the help of an online research paper writer to help research their papers in advance. This frees up their time to travel, while coming back to a great set of research – allowing them to jump straight into the writing process. There are no savings to be made on the Metro or the RER, but both of them are cheap enough anyway. However, if you need to travel out of the city / across Europe, you can save money on the TGV if you’re under 26. If you want to navigate the city by water, the Batobus is a great way to get around and see the city at the same time, plus savings can be made if you’re a student. Admission to attractions / museums is where you’re going to be able to save the most money. On average, full price admission to museums is probably roughly the same price, or slightly cheaper than here in the UK. But, if you’re a student / youthful you can save a few euros or even get through the turnstiles without handing over a single cent. Eiffel Tower: reduced rate if you’re 24 or under. Tour Montparnasse: reduced rate for students and those 20 or under. Pantheon: free if you’re under 26-years-old and live in the EU. Louvre: free for under 18s, and those 25 and under who live in the EU. Arc de Triomphe: discount for students and those 25 and under. Free if you’re 17 and under. Notre Dame tower: free for those 25 and under living in the EU, and student discount available. Musee d’Orsay: free if you are 25 and under living in an EU state, or reduced rates for under 25s who are citizens of non-EU countries. Catacombs: free if you’re 17 or under, reduced rate for 18 – 25 year olds. 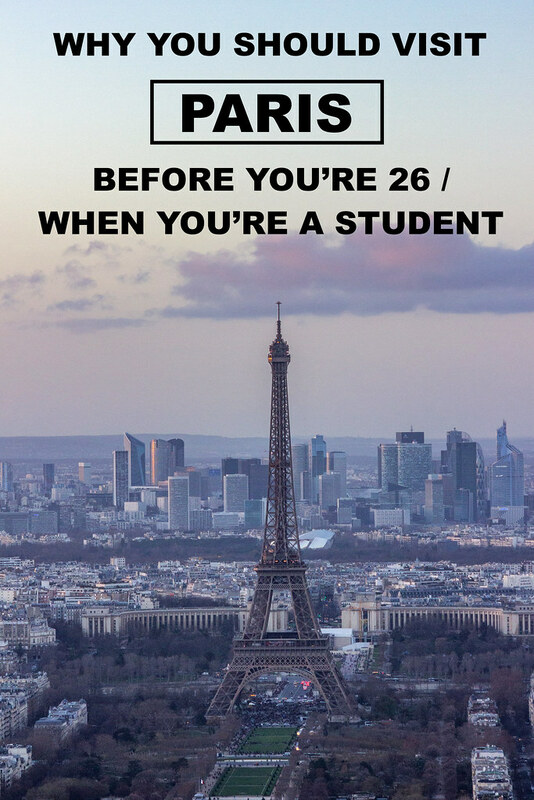 What if I’m not a student / or am over 26? All is not lost! Some attractions may have free admission on certain days of the week / month for everyone. For example, Musee d’Orsay is free on the first Sunday of the month. On top of that, there are some attractions that are always free such as Sacre-Coeur or Notre Dame (note that the tower or crypts are not free), and there are lots of free things you can do in Paris such as explore the gardens or eat crepes by the Seine. Additionally, the Paris Pass, or the Paris Museum Pass may be something that’s worth while if you plan to visit a lot of attractions during your stay, but that’s something you’ll need to weigh up by comparing prices of the pass and what you get for it, with the prices you’d be paying for admission. A trip to Paris doesn’t need to be expensive, and a little bit of planning can help you save. As I mentioned above, if you’re booking a trip to Paris, here are a few tips to help you save on your booking. Have you visited / would you like to visit Paris?